This is a much more powerful and terrifying form of the Hydra, found swimming around Ash Lake. The Black Hydra will follow and harass you constantly throughout Ash Lake, chasing after you and pelting you with water projectiles about every ten seconds, making its harrowing presence the primary "theme" of Ash Lake. It is identical to its brother, the Hydra, in appearance, save for being a menacing black color. Each head can spit an extremely powerful water projectile that can travel a surprisingly long distance from it. When you are within melee range, the Hydra heads will all dive at you, which can be blocked. They may also clip into the sand. If you are on the opposite side of the beach than it, the Hydra will seemingly jump across the entire strip of land and will attack you from its new position. The water projectiles should be avoided at all costs. They do heavy damage and can travel a surprising distance. There is terrain you can use to hide from the attacks as you progress through the level, but keep in mind to stay away from the side where the water projectiles are hitting, because sometimes they will damage you through a thin wall. Obtaining the Rusted Iron Ring would lessen the difficulty of the fight as it allows you to walk through waterwithout speed reduction. The Hydra will seem to stop chasing the player once they pass the final Man-Eater Shelland will simply shoot projectiles towards them. Using the bonfire next to the Stone Dragon after being chased does not reset the Hydra back to the beginning but instead places it half-way along the pathway next to the large tree. The Hydra's awareness of the player though is reset and it will not give chase until spotting the player again. Should you choose to try to defeat it, you can employ the same strategy as the Hydra. 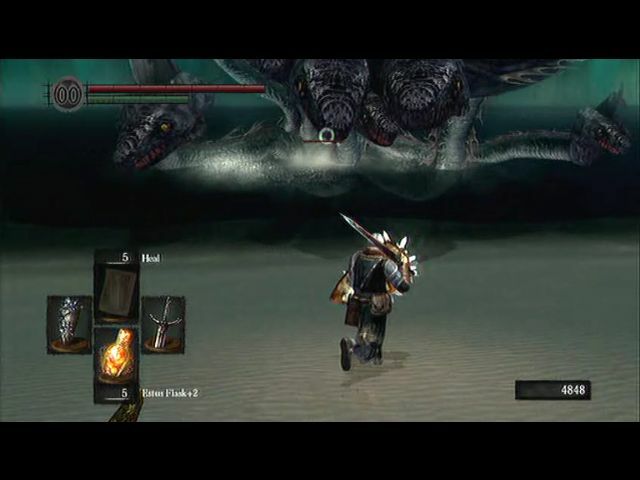 There is a shallow area at the shore and the Black Hydra will slowly move towards it, bringing it heads over the shoreline so you can stand and fight it. Make sure not to fall into the lake. Again, once close, just keep up your shield - you should be able to deflect all damage with a good shield. Keep in mind it is much stronger than the Hydra, so if 2 or 3 heads hit you at once it may break your guard, the damage will carry over and you could be knocked back. After each attack, simply locate one of it's heads and hack away. Rinse and repeat until the Hydra is defeated. Exploit: Unlike it's cousin, the black hydra can be lured onto land. When it tries walking on solid ground it dies. Exploit: You can also find a safe spot to the left of the Hydra's starting position (near where you would run to pick up a dragon scale), among the small trees and fallen logs. There is a place up against the side of the map where you can wedge yourself into the trees/wall and be safe from the water attacks. It doesn't look safe, but it is. You will still have a view of 3-4 of the Hydra's heads, so with some patience and a bow and arrows you can shoot a number of the heads off in safety. This will let you cut down on the water attacks and also open up a huge gap in the pattern of the physical head attacks, making it easy to then run out and attack the Hydra directly. The Hydra is weak to lightning. For a mage, the Grass Crest Shield and Ring of Steel Protection are life savers. For other builds, you just need to ensure that you are able to recover your stamina fast and have good poise. From the Bonfire, head straight towards the Hydra. Try to get as close as you can to it without falling into the deep end. It will most likely use a projectile attack, which will fly over your head. The attack will now change the to heads lunging into the ground, taking a lot of stamina as you block it. What you want to do, is try and find a spot on the land (moving backwards) where he will start using his projectile attacks again - once fired, you should be missed by stepping a few paces ahead. This is the ideal work space - you have some land, and he is using his lunging attacks now. When you hear the Hydra getting ready to attack, move a bit back and do a roll backwards just before the moment of impact. Now is your queue to attack. Now, head back to the sweet spot and repeat. For Mages (or any kind of caster for that matter), since you can only lock on to the "core" of the Hydra, you need to move in such a way as to line up one of the heads/necks before attacking. This is also helpful for players who use Lightning Spear. NOTE: Should you get knocked over by the Hydra, don't bother sneaking in a quick attack, there is no time and you will probably miss anyway. So use your flask instead. As you enter Ash Lake, you will see a bonfire to your right and a Hydra lurking in the water straight ahead. For a mage, the Grass Crest Shield and Ring of Steel Protection are life savers. For other builds, you just need to ensure that you are able to recover your stamina fast. When you hear the Hydra getting ready to attack, move a bit back and do a roll backwards just before the moment of impact. Now is your queue to attack. Now, head back to the sweet spot and repeat. For Mages, since you can only lock on to the "core" of the Hydra, you need to move in such a way as to line up one of the heads/necks before attacking. NOTE: Should you get knocked over by the Hydra, don't bother sneaking in a quick attack, there is no time and you will probably miss anyway. So use you flask instead. An easy way is right when you get into Ash Lake, by the first bonfire. The Hydra cannot walk on the shore, so just get close and use the same strategy as the one in Darkroot Forest. It's very easy and almost harmless even as a melee.